This article is part four in our ongoing Python tkinter tutorial series. When we left off in part three, we had just completed configuring the inputs for our interface, which included text entry, label and button widgets. We'll now move on to the widgets necessary for conveying the application's two outputs: 1) the hash digest value of the file input supplied by the user, and 2) a message indicating whether the file hash generated by the app matches the optional hash value that may be supplied by the user. 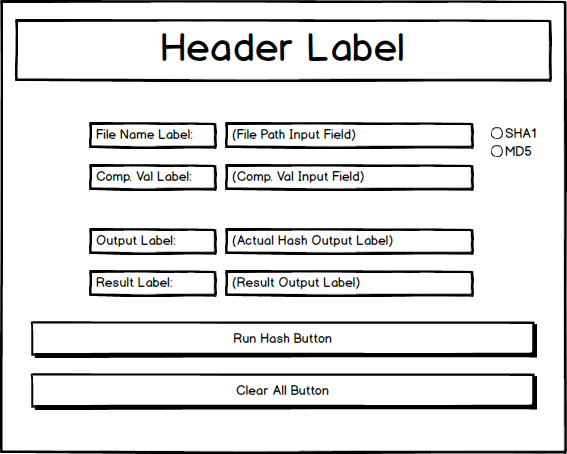 In our mockup design for the application's interface, the output-related objects are comprised of four different widgets, all of which are basically just labels: 1) a pair for the output value of the digest that results from hashing the input file, and 2) a pair indicating whether that hash digest matches the optional input value that may be supplied by the user. Since the output values are going to be dynamically generated, we're also going to need two tkinter string variable objects to grab and display the dynamic values. However, we have to be a bit careful here. If you run your app as-is, where we left off in the previous article, you'll notice that you are not able to copy the text from any of the labels we've already configured for the app. This is simply not possible because of the nature of Python tkinter labels. But it would obviously be nice if users were able to copy the output digest of the hash function. Indeed, most users would probably expect they would be able to do so, and would be annoyed if they couldn't. 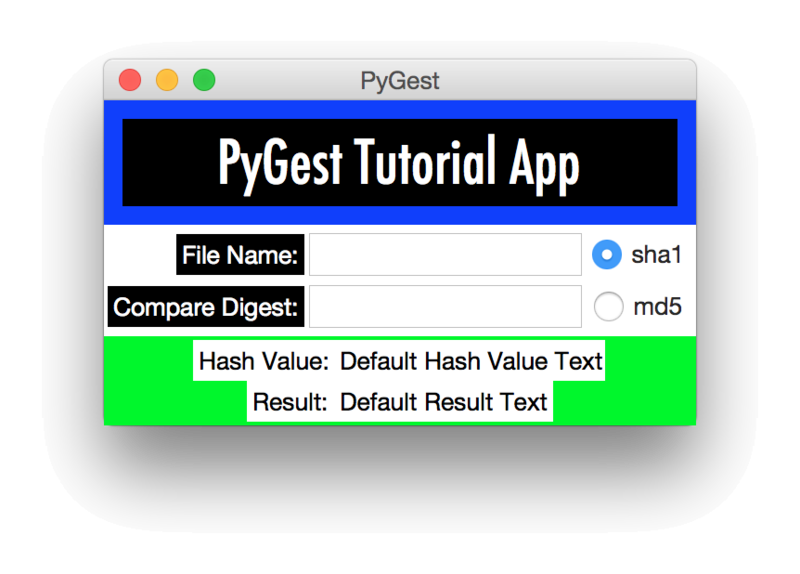 For this reason, we are going to use an Entry widget styled to look like a label for the hash value output, since you can copy text from an Entry widget. This should all look pretty familiar by now. Notice, we have embedded the outputs frame at row 2, column 0 in the main frame since the inputs frame is in row 1 column 0 and the banner is in row 0 column 0. We've also given it some basic styling so we know where it is, and made it sticky in all four directions. Our outputs frame is going to have two columns (one for a label indicating the name of the output, and one for displaying the output itself) and two rows (one for the hash digest output, and one for the result message indicating whether there is a match). Let's define them now, giving each a weight of 1. Taking a stab at the top row of outputs, we'll need: 1) a label to indicate to the user that she is looking at the output hash digest value, 2) a string variable to hold the hash digest value, and 3) an entry widget to provide a selectable display of the value. Now we'll move on to our second row, which will hold two labels: one indicating that that we are looking at the result of the matching function, and one displaying the result itself (i.e. if there was a match between the user-supplied hash value and the actual hash value of the user-supplied file or not). We'll also need a string variable to hold the desired result message. The code above is pretty straightforward, and very similar to what we did for the previous row. We have a label indicating that we're dealing with the result, embedded it in row 1, column 0, and made it sticky to the east. Next we set a string variable as an instance attribute because we need to be able to set it from other methods, and provided it with a default text string. Finally, we have a third label that we are going to set dynamically with the appropriate text indicating the outcome of the hash check. With that, we're done with the first stab at our outputs widgets. Wow, that was easy, no? We may find ourselves tinkering with these widgets a bit more as we add the last layer of functionality to the app. We're now ready to configure our app's buttons, and hook them into our inputs and outputs through their corresponding actions! You can review previous articles from this Python tkinter tutorial at the link. You can find the next article in our tkinter tutorial series (part 5) at the link.